I absolutely love cupcakes and had they been the “in” thing all those eons ago when I tied the knot, I would have totally served cupcakes at my wedding. 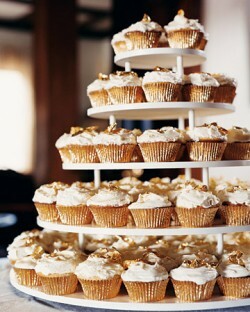 And these golden cupcakes would have been at the top of my list of favorites! Don’t you just want to grab a cup of coffee or a glass of ice cold milk and dig right into this baby? Lots of cakes that we feature are all about the looks. And so often, I almost can’t imagine cutting into them because of the hours and hours of work they took to make. 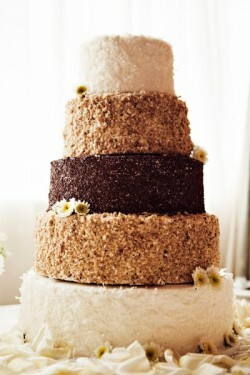 But this cake invites you to get comfortable and cut a big ole’ slab! White Cake with Chocolate Scroll Work, Take Two!